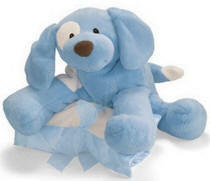 Signature GUND softness makes this a wonderful gift for a newborn. Pink spunky has white patches and an adorable big brown nose. The comfy white blanket has a satin underside and is tied with a bow and trimmed in pink satin. If you are looking for a newborn baby gift or shower gift, GUND delivers. Add personalization on the baby blanket for a baby keepsake gift that parents and baby are sure to love. 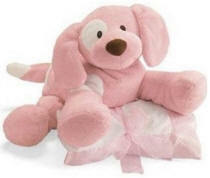 A lovable hugs blush pet with a satin trimmed blanket too! The perfect baby gift - a plush puppy for baby to snuggle and a personalized blanket to keep baby warm and a keepsake for mom. Blanket is trimmed in blue satin and has a satin underside.